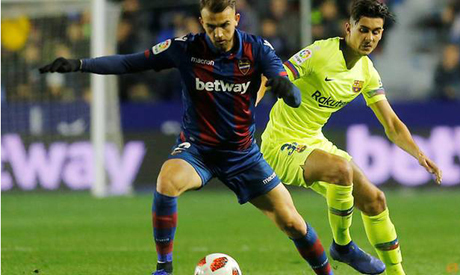 Levante have filed a complaint to the Spanish football federation (RFEF) stating that Barcelona fielded an ineligible player in their Copa del Rey last-16, first-leg match, the La Liga side said in a statement on Twitter on Friday. Levante say that Barca defender Juan 'Chumi' Brandariz was ineligible to play in the game on Jan. 10, which Levante won 2-1, as he was serving a suspension for Barca's B team, which he had earned in a Spanish third-tier game. The biggest stumbling block to any complaint is that the deadline expired on Monday, though the RFEF has previously approved claims made by teams after a deadline has passed.